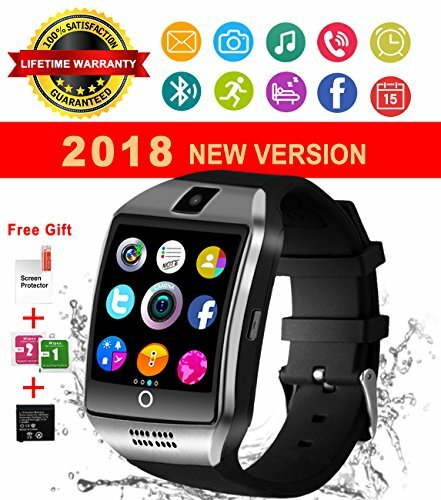 IFUDA waterproof smart watches support bluetooth connection via phone! Remote camera, pedometer, night light function, calories counter, walking distance tracker,24 hours sports monitor, incoming call and message remind , Alarm, stopwatch, time display. Monitor,Pedometor,Calculator,Clock,Calender NOT SUPPORT BT Notifications,Sync Message,Remote Notifier,Send Message,Phone Book,Camera, Facebook, Twitter. ☛【Smart Gift for You and Lovers】: This is a new upgrade smart watch with so many function, easy to use. it is suitable to any age persons. We will offer you LIFETIME WARRANTY of our smart watch, purchase it without any worries. Our bluetooth smartwatch is your best choice, you won't regret. Go and get your lovers a big surprise! ☛【Long-Lasting Battery life & Extra Replacement Battery】: 350mAH lithium battery, average using time is 2 days. We also give you one piece Free Battery as a Gift. Never worry about out of battery problem. ☛【HD Touch Screen and Fashion】: Our smart watch has an awesome display as well as the hypersensitive screen touch, which can supply you the clear display even in the glare. Fashion and modern surface display make your smartwatch more fashion and outstanding.